A major change in the way people get information has occurred in the last 40 years. Most citizens and students now get most of their information about their own country and the wider world from the electronic media. The average teen watches approximately 23 hours of television per week. Each year, most children spend about 1,500 hours in front of the television and 900 hours in the classroom. Children see at least an hour of commercials for every 5 hours of programs they watch on commercial television. Digital media has changed the way Americans, and indeed the world, communicate with each other. 63% of Americans now go online, and teens spend an increasing amount of time on the Internet  downloading music, gaming, in chat rooms, or Instant Messaging their friends. Children who watch a large amount of violent programs tend to favor using aggression to resolve conflicts. With an ever-increasing number of media and communication options, from satellite television to cell-phone text messaging, the complexity of choices provides the need to examine the media to better understand the basic elements of good communication. This is the purpose of the educational outreach effort for My Journey Home. We want to assist community college and high school educators in engaging students to better understand the media and how to use basic messages to communicate information and stories. By taking the issues and themes of immigration from the stories in the documentary My Journey Home, we also want to renew the rich history of storytelling using the media. To do this, Media Literacy workshops can assist community colleges and high schools in helping students to better understand the media, elements of storytelling, and how to use both. The outreach project has two components: a Media Literacy workshop for teachers and students to be held at your school and a student multimedia project and competition. The My Journey Home outreach project provides high school and community college students with a hands-on learning experience designed to help them understand the power and uses of the media and to become informed and discriminating media consumers. 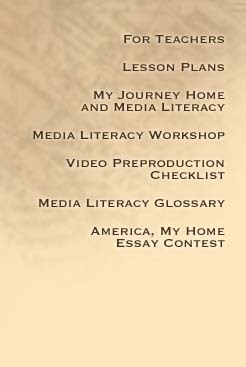 As you explore the curriculum, keep in mind that the end product for the My Journey Home outreach will be for students to develop print, audio and video essays on what it is like to be an American.